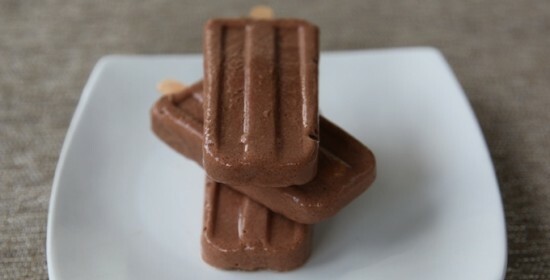 Coconut Milk Fudgesicles Sugar Free & Dairy Free. Use unsweetened coconut milk from a carton + Stevia for a low calorie treat or use canned coconut milk…lite or full fat. If you don’t like using Stevia, use raw, unpasteurized honey instead. Chocoholics pounce on studies stating that dark chocolate is good for you. But is dark chocolate “candy” really healthy? Here’s the deal…raw cacao beans, raw cacao nibs, and raw cacao powder are superior sources of antioxidants. They contain flavanols, a flavoinoid that helps protect us from environmental toxins and cellular damage. Antioxidants help the body fight free-radical damage at the cellular level. Oxidation in the body is caused by a wide range of factors, from normal breathing to inhaling smog. Antioxidants counter oxidation in the body, to help protect us from pollution, aging, and certain types of cancers. Raw cacao beans, nibs, and powder all contain the unique alkaloid chemicals phenylethylamine, anandamine, and theobromine. The “feel good” chemicals associated with eating chocolate, that increase endorphins in the brain. Phenylethylamine quickens the heart, anandamine causes a feeling of euphoria, and theobromine relaxes the body. The bottom line is that consuming dark chocolate stimulates the brains neurotransmitters, sending pleasurable feelings throughout the body. But before you run out and buy that bar of dark chocolate, keep in mind that most of the benefits of raw cacao are destroyed during the candy making process. Most commercial chocolate is made with roasted cacao beans and Dutch-processed cocoa powder. High roasting temperatures destroy many of the cacao beans benefits. Dutch processing uses harsh alkaline chemicals which further destroys cacaos natural benefits. Look for a good quality, organic, raw cacao powder, like Navitas Naturals brand. They mill their cacao beans at a low temperature to protect each beans full range of nutrients. Dark chocolate candy bars also contain refined sugar and a lot of calories. And unless your dark chocolate bar says 100% organic, it most likely contains GMO soy lecithin. Even if your dark chocolate bar is made with raw cacao powder and contains organic soy lecithin, most soy crops are cross-pollinated with GMO soy. Chocoholics don’t despair! You can still enjoy chocolate with its full benefits intact by switching to raw cacao powder and raw cacao nibs in shakes, smoothies, and other treats like the recipe above. It’s as simple as adding raw cacao nibs on top of your favorite leafy green salad. You’ll be pleasantly surprised at the great addition they make in terms of crunch and flavor. 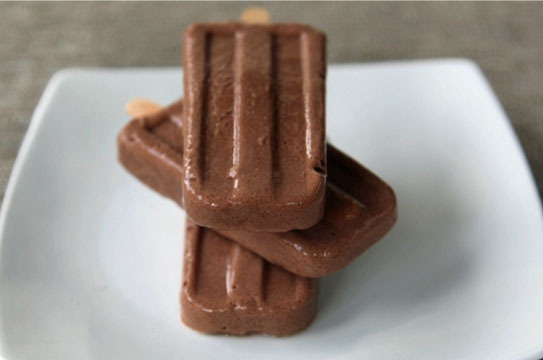 Metatags: Coconut Milk Fudgesicles Sugar Free & Dairy Free. Use unsweetened coconut milk from a carton + Stevia for a low calorie treat or use canned coconut milk.